This window contains all nodes existing in the current world. Some nodes can be instances of the asset files: meshes, sounds, terrains, instanced nodes, or nodes stored in the *.node files. When you add a new node to the scene via the Menu Bar (the Create menu) or by dragging it from the Asset Browser, this node is automatically added to the nodes hierarchy and displayed in the World Hierarchy window. The World Hierarchy window allows filtering nodes by name and by type, collapsing nodes hierarchy (showing only the parent nodes and hiding the child ones), expanding nodes hierarchy (showing all nodes added to the world), rearranging, reparenting, cloning, renaming, deleting, and grouping the nodes. To rename a node, right-click it, choose Rename in the drop-down list, and type a new name. 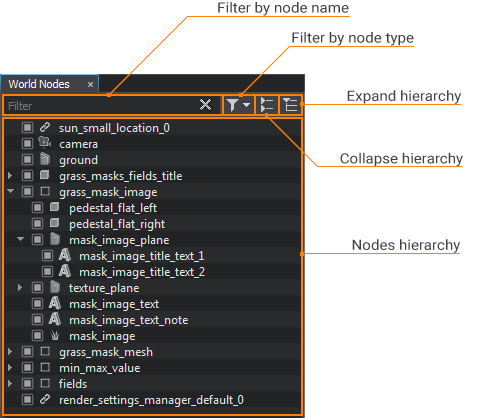 Nodes in the scene have hierarchical arrangement: each node (parent node) can have multiple children (child nodes). It allows you, for example, to change the transformation of several nodes only by transforming the parent node. 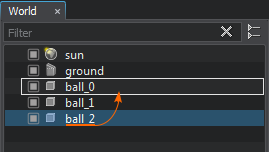 To collapse or expand the list of child nodes, click the arrow to the left of the parent node. You can also collapse all child nodes in the World Hierarchy window by clicking , or expand the list to see all nodes in the World Hierarchy by clicking . 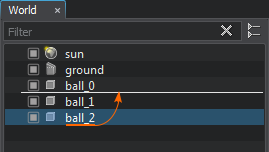 To add one node as a child to the other in the hierarchy, or reparent a node, drag it holding the left mouse button to the desired parent node. You can also select the node and press Ctrl+D to perform the same operation. The new node will be created at the same hierarchy level as the original one, and have the same transformation. If the original node has children, they will be cloned as well. You can also select a node and press DELETE to perform the same operation. When grouping nodes, a new dummy node is created, and all selected nodes become its children. At that, the hierarchy of grouped nodes persists.